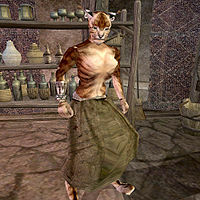 Khinjarsi is a Khajiit slave working at Desele's House of Earthly Delights. She is Helviane Desele's personal slave and assistant, working behind the counter serving drinks to the patrons. It is not possible to free her under normal circumstances, as there is no slave key in Suran, and the go free topic does not even display on her. It is still technically possible to free her by using a Command spell on her and bringing her to a cell where there is a slave key. She wears a common skirt and a slave's right bracer. Like all Khajiit, she can see well in the dark and can demoralize others for short periods; otherwise she knows no spells. This page was last modified on 8 April 2014, at 02:59.